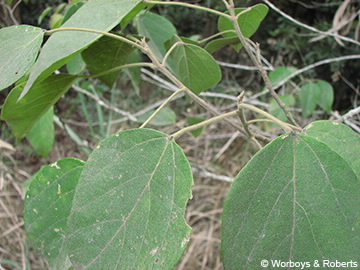 This small tree has simple, alternate leaves, blades to 14 x 11 cm, petiole is about as long as the leaf blade; yellow sessile glands are obvious on the lower surface as well there are two flat glands near the junction of the blade and petiole; blade 3-veined at base. Flowers small, yellowish due to the presence of the yellow sessile glands. 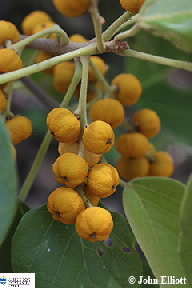 Capsules covered in yellow glands.